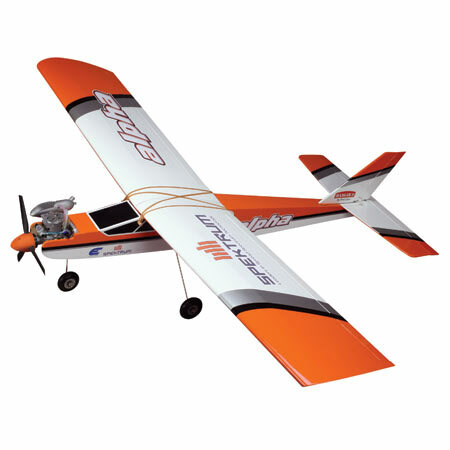 The Hangar 9 Alpha Trainer is the ideal beginner radio controlled airplane that comes completely built and can be electric or glow engine powered. 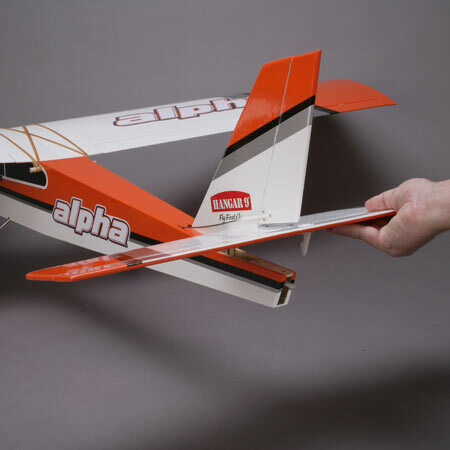 Of all the radio controlled planes for beginners, the Hangar 9 Alpha virtually is ready to fly right out of the box! 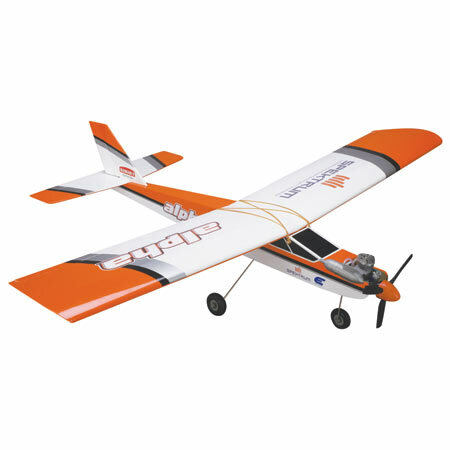 This maybe the most popular of all the beginner airplanes, available today. 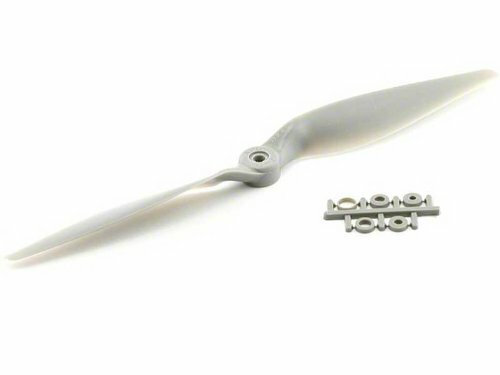 This is an RTF (Ready-To-Fly) style of airplane, that requires the minimum of assembly. Construction is from laser-cut balsa and ply and covering is UltaCote film. This form of construction lends itself to any repairs that need to be done and spare parts are also available, if recovery from a major crash should be required! 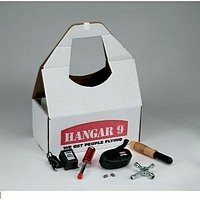 The Hanger 9 Alpha trainer is ideal for learning to fly, at the club field, with the assistance of an instructor. This is not a model to fly in the local park! It is too big, requires a bit more space but it is very easy to fly! For more details,visit the appropriate page on Horizon Hobbies site by clicking here. This is the Hangar 9 video, and shows some nice flying shots of the Hangar 9 Alpha Trainer, along with some RC aerobatics! Loops and rolls are shown but please learn the basics before trying these! Notice in the photo here of the Hangar 9 Alpha trainer, that the wing is held on with rubber bands. Usually, on modern airplanes, a bolt-on wing is utilized. For beginner airplanes, I think that Hangar-9 have been very smart, in choosing this "old-fashioned" way of holding on a wing. The rubber bands make a very flexible attachment and the first time you see your model "cartwheel", bouncing from wing-tip to wing-tip, you will thank the manufacturers for using the good old #64 rubber bands! Please stock-up on the #64s-you will need to replace them fairly often. Here we see how the tail assembly, of the Hangar 9 Alpha Trainer is slipped into position before it is bolted into place. I am not sure about this bolt on tail assembly. Check the tightness of the bolts constantly and please use the thread locker provided with the kit. The great advantage of the bolt on style is that if replacement or major tail repair is necessary, then it is very easy to unbolt the tail and bolt in a new one. It you find that the tail is coming loose frequently, then epoxy the whole assembly into position, ensuring it is square with the fuselage and aligned with the wing. The landing gear must be installed and landing gear straps bolted onto the fuselage bottom .Note that the wheels are already installed! Note also that the rudder, elevator and throttle servos have been mounted. This photo shows the wing panels of the Hangar 9 Alpha trainer being assembled on the aluminum tube. 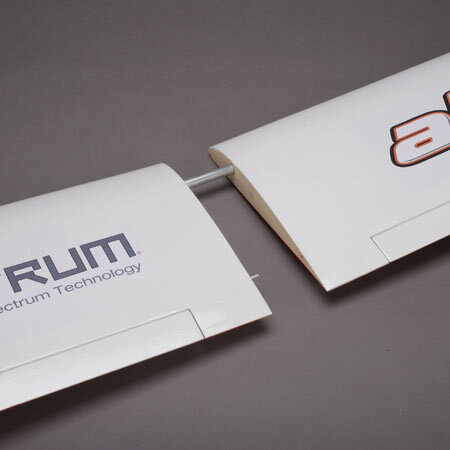 Horizon give you a choice of taping the wing panels together or using epoxy for a permanent installation. The finished wing span is 63" and I would think that a one-piece wing is not too much of a problem to transport. I would definitely recommend using the epoxy method! Here is the Evolution 40 NX Glow engine. 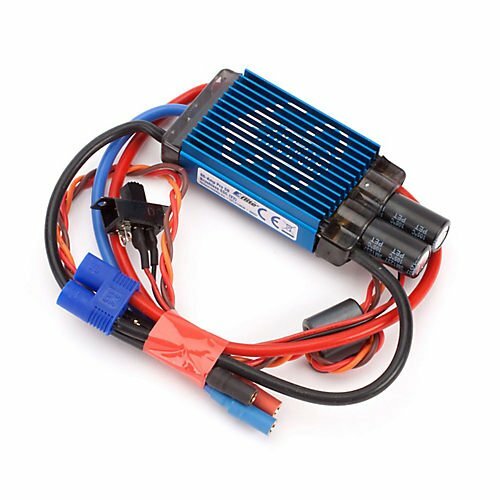 This is an ideal motor if your preference is for a glow powered model. It is easy starting and powerful. You can click on the photo and get more details and the option to buy from Amazon. (Please note that I do receive a SMALL commission for any sales). Your price is NOT affected. This is the smallest glow engine recommended. Click the photo,or here, to visit Amazon for details. Here we see the Evolution Trainer Power System. 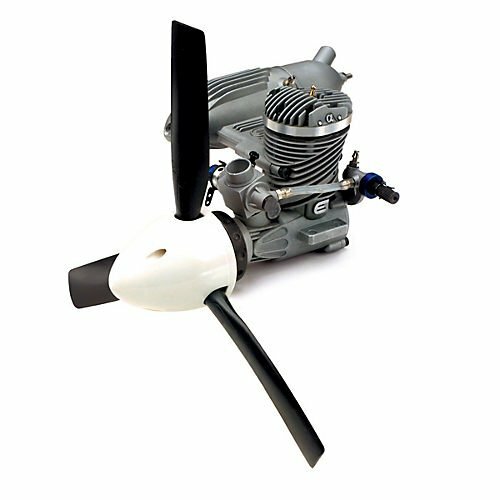 This comes complete with an Evolution 46NX engine, spinner, prop and glow plug. The needle valve has been pre-set and no running-in is necessary. 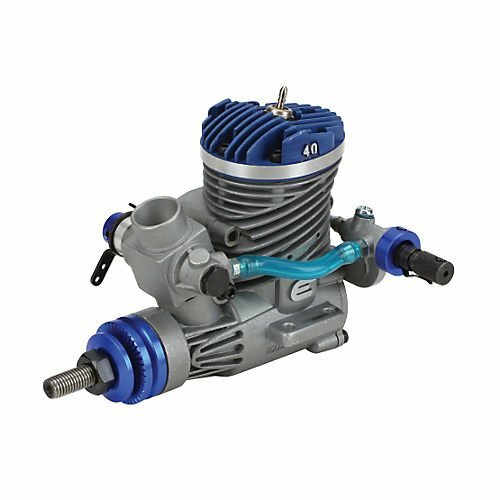 This package is designed for the beginner and is the ideal power plant for the Hangar 9 Alpha trainer. Click the photo or here, to visit Amazon for details. 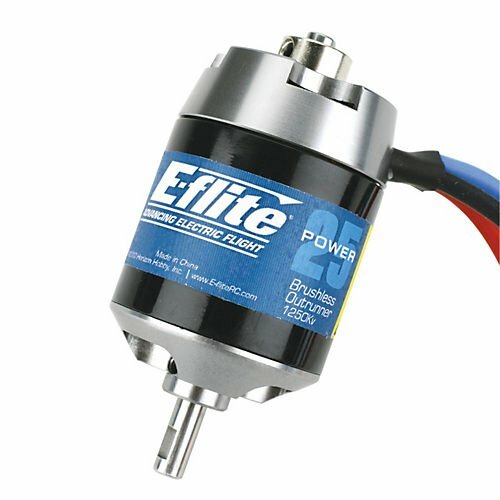 The motor recommended is the E-Flite Power 25. Maybe consider a Power 32 for a bit more power and extra nose weight (Required with the electric version) Click the photo or here, to visit Amazon for details. 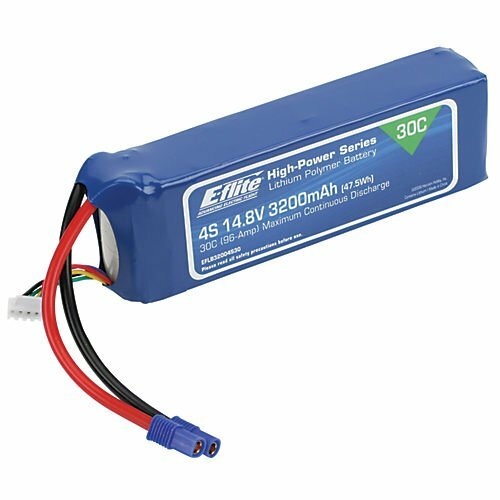 The battery required for the Hangar 9 Alpha Trainer is a 4S lipo of 3200 mAh capacity. Click the photo or here for more details from Amazon. The ESC is the 60 or 80 Amp Pro Switch-Mode BEC Brushless ESC. Note that the "BEC" is an acronym for Battery Eliminator Circuit. Meaning that a separate battery is NOT required for the radio system. Here is the required prop. An APC 11x8E. If you use a glow engine to power the Hangar 9 Alpha Trainer it will require support equipment. You will need a fuel pump, glow igniter and maybe an electric starter. You will also need a 4-channel radio system, with 4 regular size servos. Is 100 % complete and just needs simple assembly. High wing design, with a flay bottomed airfoil, makes for a very forgiving flight envelope. Tricycle landing gear makes take-offs and landings simple. Proven concept that has taught many people to fly. 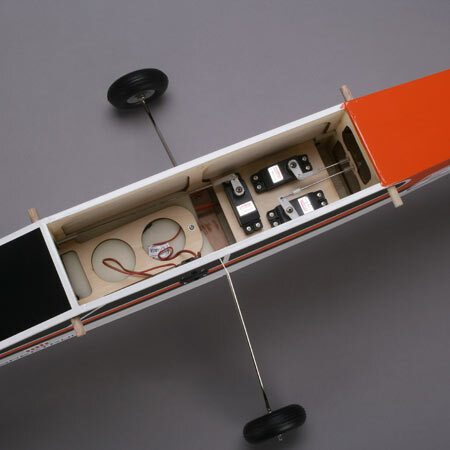 The electric powered version is tail heavy and requires nose weight to achieve balance. The majority of the reviews that I read were very favorable. Most of the criticisms were by those beginners who did not have an instructor to help out. .A number of times the excellent service that was given by Horizon Hobby, was mentioned. Check the screws that fix the engine mount to the firewall. These may protrude through and rub on the front of the tank. This can cause holes in the tank, that will lead to problems! It may be an excellent idea to remove the motor and mounts and fuel proof the firewall with epoxy. Check with your instructor first. This process can extend the life of the airframe. There was mention of a large gap at the wing leading edge and fuselage. If so then I would consider filling it in, to keep the interior free from oil. The electric version does need a lot of nose weight to balance at the required point. Some people moved the wing back 3/4 to 1" to avoid adding the extra weight. If you consider doing this, please seek the help of an experienced modeler. For our Canadian customers- We have included this link. We have received great service from Great Hobbies! All prices are in Canadian dollars and are very competitive. No duty or customs fee to pay! Note that by clicking on the Great Hobbies logo, you will find yourself on the appropriate page of their web site. 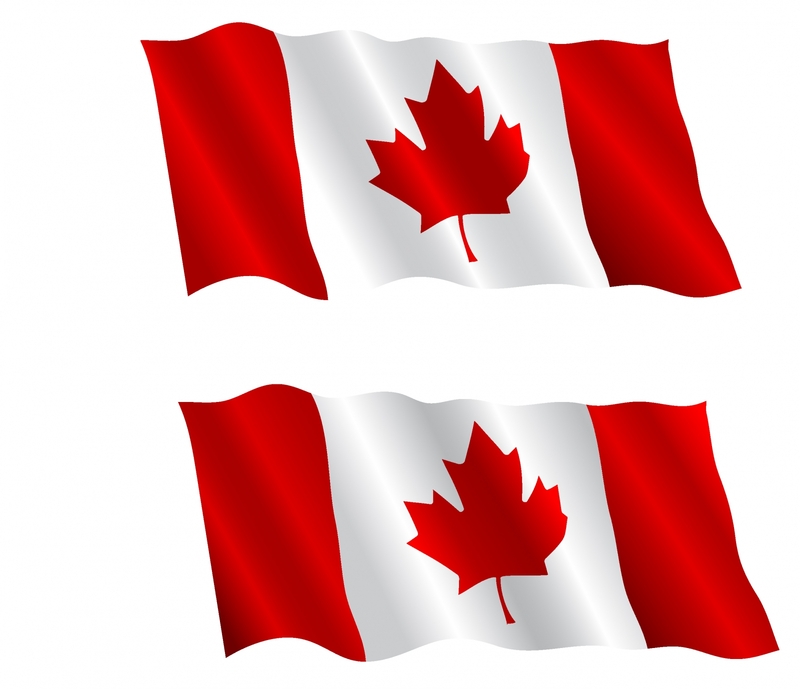 We receive no commission, if you were to buy and offer this as a service to our Canadian visitors.